Drum brakes and full suspension - just what you need when riding in a quarry. 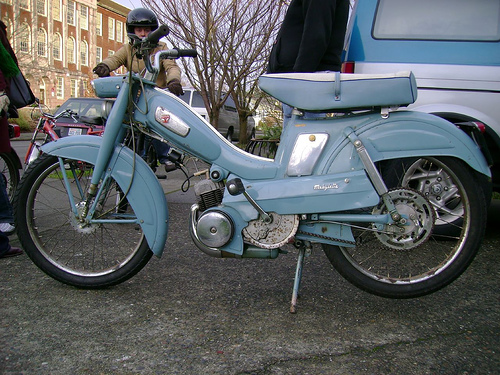 My particular Mobylette had a rather interesting history. According to the log book the five previous owners were all vicars. I wonder how may times that machine had been blessed ? A very useful lesson was learned from this machine - don't put your thumb anywhere near the chain when the engine is running. I still have the scar. This bike also falls into the "what did I do with it" category. It was around this time that I ended up "playing motorbikes" with Andy Mountford and Ian Downes, something that I still do to this day.